Luxury mountain estates construction continues at The Bluffs new homes. The first home exteriors are being finished on the models in Southern Highlands real estate. Model homes will be an integral part in selling these semi-custom homes built by Pacific Southwest Homes. Attention to detail including exterior finishes and landscaped designs are included. The developer’s philosophy for their signature New Millennium Homes, add personalization to your home without the extended time needed with a traditional home builder. The new homes for sale range from 6,000 to 6,800 square feet. The Bluffs are located alongside the mountainside to blend in with its exterior. Want a spectacular view of the Las Vegas Strip? Residents at the luxury homes enclave will have full views because of the higher than usual vantage points in the terraced hillside. Three different design themes will be showcased amongst the three luxury model homes. Plan 1000 has a resort style feel, Plan 2000 has a Tuscan design and Plan 3000 has a contemporary California vibe. 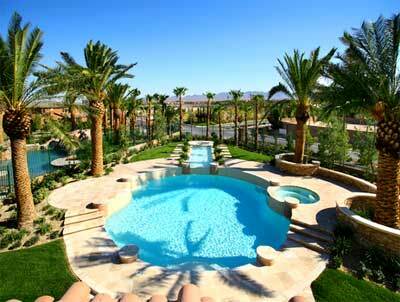 The luxury homes in Las Vegas, NV all include the Green Home designation from the Build it Green program. A select few buyers will be able to experience living at The Bluffs prior to the grand opening in the spring. Several sites will be available for purchase from $3 million and measure over one acre. Call 702-505-6988 for VIP Las Vegas residential real estate mls search with real estate agents. Luxury mountain estates construction continues at The Bluffs hillside homes.